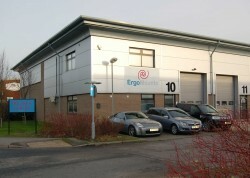 ErgoMounts Ltd, based in Aldershot are a successful manufacturer and distributor, providing ergonomic mounting solutions for computer and flat screen televisions and monitors. 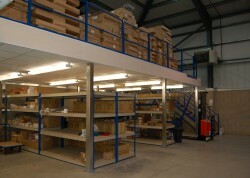 ErgoMounts were in need of a new mezzanine floor when they realised that their existing warehouse was full. To avoid expensive relocation costs, they decided to increase their storage capabilities by asking more than capable HMF to install the mezzanine floor in their warehouse. HMF have previously worked with ErgoMounts when HMF fitted out the whole building from a basic shell to form new first floor offices and customer showroom. This time ErgoMounts just needed storage and work space. 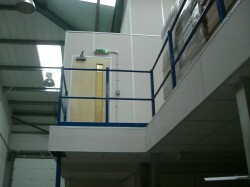 The mezzanine floor was successfully installed along with 1-Hour fire protection. It further included a suspended ceiling under the mezzanine and column cases and perimeter fascia to enable the floor to be also used as work or packing area. New lighting was installed under the floor. The main challenge of the project was to build everything around their existing shelving layout as ErgoMounts did not want to move their stock or cease trading during the works. In order to satisfy the customer’s needs, a fast track installation project was devised using a combination of a Fork Lift truck and a manual Genie lift to lift steelwork over the existing shelving bays. In just two day, the floor was installed followed by the fitting of the ceiling and lighting. HMF also handled the Building Regulations Application to ensure that all aspect of the project was compliant and done to current health and safety standards.